I’m not holding my breath. But a telling controversy involving a newly published novel by Athabasca University creative writing professor Angie Abdou does show us that even some First Nations intellectuals now are becoming infuriated by the campaign to control the permitted range of literary expression in my country. I’m hoping it’s a sign of things to come. Abdou is one of those progressive, conscientious, sensitive white writers who dedicate themselves to all the penitent literary rituals of our age. She seems to have done everything humanly possible to make sure her new book, In Case I Go, would offend no one, honour everyone, and perhaps even help heal the wounds inflicted by Canada’s history of cruelty against indigenous peoples. Instead, she’s been raked over the coals by critics accusing her of ever-more-exotic artistic sins. The case shows how the war against cultural appropriation can be leveraged to corrupt the very way in which literature is conceived. According to Abdou’s most prominent critic, the best way to tell indigenous stories is through collectively approved celebratory works that advance the community’s cause and image. But of course, governments around the world produce this sort of writing all of the time. The word we often use to describe it is propaganda. And no one would ever confuse it with true literature. Yet this is exactly the kind of writing that Canadian publishers are now expected to pump out. And efforts to push back against the trend are met with claims of bad faith, bigotry, and even accusations of cultural genocide. Far from protesting, many white writers and editors are enthusiastically joining in the censorship chorus. In the current environment, this sort of strategy even makes a certain kind of careerist sense: by denouncing Writer A for culturally appropriative wrongthink, Writers B, C, and D can showcase their zeal for the progressive cause. Angie Abdou isn’t quite a household name in Canada. But she’s no amateur. Her novel The Bone Cage was a CBC Canada Reads finalist in 2011. Her follow-up, Between, was named to a number of “best-of” lists for 2014. And she’s been written up favourably over the years in most of Canada’s large newspapers and literary journals. Dust-jacket photos show an almost impossibly fresh-scrubbed Ivory Girl mom and dog-lover. Her family background is a sort of Canadian novel premise come to life—complete with a Syrian immigrant grandfather who worked as a coal miner before moving to Saskatchewan and marrying a Lakota woman. While Nicholas works long hours at the local coal mine and Lucy battles loneliness and depression, [their son] Eli befriends Mary, a troubled Ktunaxa [First Nation] girl who lives next door. Both children, disturbed by visions of people and places long forgotten, are challenged to account for past lives of seduction and betrayal. Canadian fiction isn’t a profitable field. Writers usually get paid a few thousand dollars (low five figures if they’re lucky) for work that takes years to complete. And Abdou’s publisher—Arsenal Pulp Press—isn’t exactly a global player. The reason Abdou chose to rewrite her book twice wasn’t because she was plotting to get rich off indigenous stories. It was because she genuinely thought that story-telling was an important and fulfilling thing to do. And yet even then, she wasn’t done: Abdou still had to appear before the Ktunaxa council of elders. I confess that I have old-fashioned ideas about artistic freedom, and still cling to the idea that novelists, poets, playwrights—lo, even we humble journalists and academics—shouldn’t have to seek the permission of any court, legislature, or council of experts before we are permitted to express our thoughts. But not Abdou, who was determined to do what she could to promote reconciliation (to cite the new buzzword in this area) between indigenous and non-indigenous peoples. I stood in the centre of the [room] and told [the elders] about my novel. I said if they didn’t like my representation of the Ktunaxa, I could create a fictional indigenous name…Some [elders] nodded, others seemed skeptical. A few had questions. They talked in front of me, among themselves. They talked more after I left. A week after we met, three of them asked to see the manuscript, which I sent without hesitation. The elders who read the manuscript apparently expressed no objections to its contents—leaving Abdou free to go about the “normal,” arduous, maddening process of editing, proofreading and correction that every writer endures before a book gets published. In Case I Go launched in September, 2017, and Abdou went on a national tour. In an Author’s Note at the beginning of the book, the author publicly thanks Burgoyne and the Elders Advisory Council, and notes that the book does not purport to be a representation of Ktunaxa spiritual beliefs. Anyone interested in the subject, Abdou advises, should visit the Ktunaxa Nation web site, the URL of which she supplies. I haven’t read In Case I Go yet, but The Vancouver Sun called it “a painful read [that] is also darkly funny and elegantly written.” Ryan McMahon, a First Nations comedian and writer, told his social media followers that Abdou had provided “a beautiful example of indigenous and non-indigenous peoples working together.” And this is where the story would end in a country that had not descended into, as Abdou puts it, pure insanity. Alas, the story goes on and on. And it is worth examining the details, because the whole melodrama acts as a fine (if infuriating) microcosm of Canadian intellectual life. Before proceeding further, I should say that Abdou did make at least one small mistake during the course of the above-described events. In a follow-up piece she wrote about her treatment of the Ktunaxa, Abdou wrote that the Ktunaxa Nation Council endorsed her novel. As she acknowledged when the error was pointed out, “A Nation[‘s] Government does not endorse a work of art. I should have [instead] said that ‘I felt enthusiastically supported by the individual Ktunaxa people with whom I consulted.’” Abdou also tells readers that she regrets writing the words “Canada’s treatment of its indigenous peoples,” because “the possessive pronoun is offensive.” These are hardly serious sins. But Abdou was wise to own up to them candidly in such a forthright manner. Not that this good faith helped her much when the knives came out. Troy Sebastian is a Ktunaxa writer, speaker and artist. To my knowledge, he holds no official office with the Ktunaxa Nation Council. But it is his byline that appears on a scathing (some might call it libellous) attack on Abdou that was reviewed and edited by a Ktunaxa Nation Council official before being printed in the January/February print edition of Quill & Quire, the magazine covering the Canadian book trade. Carter refused Abdou’s request (though, as of this writing, it has not yet appeared on the Quill & Quire website). [Update, 11 Jan: Quill & Quire has now published Sebastian’s article.] Social media, on the other hand, did not disappoint. A First Nations poet and radio performer from the Ontario Six Nations accused Abdou of self-conceiving as a “hero” among “savages.” Another indigenous writer accused Abdou of betraying the indigenous people because, after researching her novel, she had failed to involve herself vigorously in completely unrelated land-use litigation involving the Ktunaxa Nation. Your job is to use your privilege to elevate the voices of the people who have helped you. Do some grunt work. But don’t speak over people. A Ktunaxa scholar went after Abdou on both Facebook and Twitter, arguing that the mere act of engaging with the Ktunaxa elders meant she was imposing on the band’s resources, and that the publication of her book served to indirectly silence Ktunaxa writers trying to tell their own stories. This critique reflects the more generalized attack on Abdou that white people simply shouldn’t talk about indigenous people at all in their literature. A local (white) cultural official confided to Abdou in private correspondence that he doesn’t even say the word “Ktunaxa,” for fear it might cause someone offence. All of which leaves Abdou not only depressed but confused. From what I can tell, she’s an across-the-board progressive on pretty much every issue imaginable (though her recent experiences are giving her second thoughts about some of the more doctrinaire postures governing Canadian cultural life, she tells me). Moreover, as Abdou has noted in print, she could very easily have fictionalized the Ktunaxa in her novel, and written about a made-up First Nation. In which case, she wouldn’t have had to spend the time and energy required to consult with three separate levels of indigenous content control. More importantly, she would have been able to write her book, instead of the hodgepodge that inevitably emerges when a dozen different people co-create a text. While everyone needs some kind of editor, true literature ultimately emerges from only one place: the soul of the individual artist. But as Abdou argues, airbrushing the Ktunaxa out of the story would also have been construed as a racist act. She wanted to do this book right, and was willing to invest the hard work and relationship-building necessary to do that. Yet at the end of the day, she’s been tarred with many of the same slurs that gets heaped on the all-too-many actual racists that populate social media and newspaper comment threads. Troy Sebastian and the Ktunaxa Nation have every right to publish their attacks on Abdou, of course—so long as they are willing to attach themselves to such nonsense, and they have the funds to back up their decision if Abdou chooses to sue for libel. But Quill & Quire’s vague let-a-thousand-flowers bloom rationale for doing so truly grates on me, because once you look past the superficially uplifting mantras about “consent” and such in Sebastian’s article, the content is quite creepy. In his piece, Sebastian more or less completely ignored Abdou’s lengthy, good-faith efforts to engage with the Ktunaxa community—including its cultural liaison. Instead, he casts her as just another cynical “settler” looking to pillage indigenous stories for profit. And Sebastian goes further: He claims that it was wrong for Abdou even to write about the process by which the Ktunaxa decided whether she could write about them—a sort of meta-thought crime. “The consultation and engagement processes,” he argues, “are not subject [to] public consumption.” This is positively Kafkaesque, especially since Sebastian’s piece (which was written under the close supervision of a Ktunaxa Nation official) promises unspecified “consequences” for breaching this as-yet-unknown first-rule-of-Fight-Club-type edict. Sebastian uses the last paragraph of his piece to promote a separate, “incredible” book project titled Celebrating Who We Are, which apparently will be created by the Ktunaxa Nation itself with the explicit goal of telling the Ktunaxa story in a way that helps the cause of “nation building.” He invites “publishers, booksellers and others in CanLit” to “help Ktunaxa share our story”—and suggests that they will be praised and honoured for doing so, in marked contradistinction to the shamed Angie Abdou. The history of Ktunaxa is, from what I know, genuinely fascinating. But the Ktunaxa Nation considers itself a sovereign entity. How does a project conceived explicitly as historical propaganda created under institutional auspices rise to the level of literature? As Abdou would be the first to concede—even a counter-revolutionary running dog like me concedes it—indigenous groups have historically been treated poorly (indeed, often cruelly) in white-authored fiction and non-fiction alike. I grew up reading racist nonsense that I have tried hard to erase from my mind. But in a liberal society, you can’t wall off particular subjects, people or communities from public discussion—or to condition such discussion upon tests of blood quantum, fidelity to approved ideological positions, or Star Chamber processes. Canadian defenders of the stigma against cultural appropriation can argue that indigenous communities are special—because the historical crimes perpetrated against them represent the signature disgrace of my country’s history. But as with all forms of de facto censorship, once you carve out special no-go zones for free speech, the exceptions quickly swallow the rule. In the case of In Case I Go, for instance, the appearance of a minor Yoga-themed sub-plot elicited a “formal letter of complaint” from the Board of Directors of the “Living Yoga Society” of Tata Creek B.C. Since “the author has publicly acknowledged and was careful to respect Ktunaxa spirituality, culture and wishes in how their ideas and practices are represented,” the authors reasoned, shouldn’t Abdou also be required to avoid saying negative things about “our ancient spiritual lineage [and] culture”? Given the ethnic double standard at play here, it’s not such a crazy question. And it shows us where the cultural-appropriation trend will take us—to a world in which the only thing that a successful white female Canadian author such as Abdou is permitted to write about is what she and other white female Canadian authors see when they ram their heads into their own collective navel. White women writing about white women. The Ktunaxa Nation writing about the glories of Ktunaxa Nation. With councils of elders and armies of Twitter trolls on hand to police the boundaries. Does this sounds like an inviting intellectual landscape for all those hot new, young writers (of whatever skin colour) that the publishing world is always looking for? If glorified mommy blogging and state propaganda are going to be your main options, why not cut to the chase and go straight into click farms and PR? Last year, it was one of my greatest honours to provide my endorsement to In Case I Go. With this in mind, it is shocking to…read references to the Ktunaxa Nation Council approv[ing] the published critique [of Abdou’s book]. I intend to follow up with my Tribal Council…From the first line of her book, I found her writing to be engaging, impressive and deserving of the widest audience possible. In addition, she set a new standard for good relationship building across cultures, and it troubles me to see anything that takes away from her good work and her integrity. Sebastian makes assumptions as to who he believes Angie Abdou is and what her intentions were when she wrote and published In Case I Go. It is quite apparent that he hasn’t read the book and did not inquire as to what Abdou’s consultation process was. If he had read the book, he would have found that Abdou makes strong statements against… resource development in Ktunaxa territory. The lead character [actually] becomes violently ill upon seeing the environmental damage caused by an open pit mine …[Abdou’s] inclusion of Ktunaxa characters is a respectful acknowledgement of the first peoples in the region, where omission of their existence would have been a grievous sleight. That sounds right to me. In fact, “reaching out” is something great fiction writers tend to do naturally—without being forced—because they always are looking to create three-dimensional characters who reflect the nuances of human existence. And while it is true that indigenous peoples often were usually tossed off as bit players in old-stock CanLit, that era is (thankfully) gone. Crude, ignorant stereotypes are just one way to kill a novel, however. As l’affaire Abdou shows, sometimes the cure is just as bad as the disease. 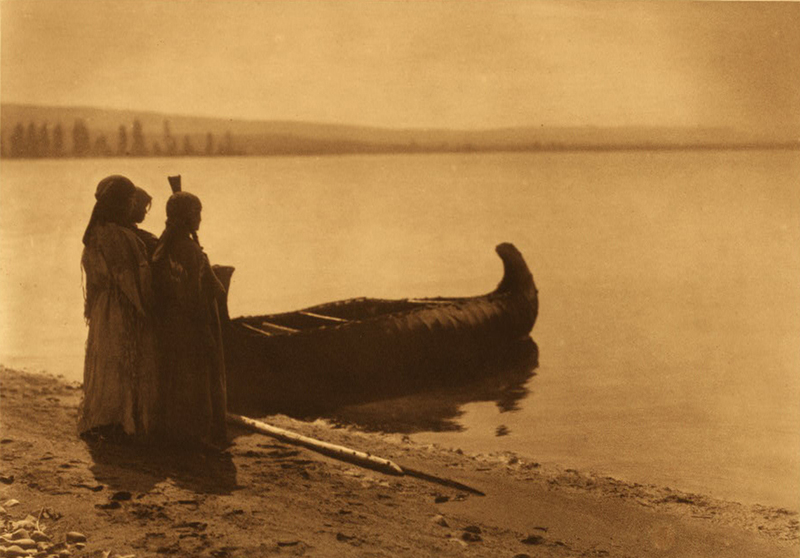 Featured pic: Ktunaxa girls, by Edward S. Curtis, 1911. Well, if you’re going to be villified anyway, why not just write what it pleases you to write? So long as you can find a publisher and readers, if you’re going to be villified anyway, why not just write whatever it pleases you to write? In any case, getting angry and hostile seems a poor way to deflect criticisms that you’re angry and hostile. And, truly, every successful culture appropriates from others. And in so doing almost always alters what it has taken to suit itself. The only cultures which don’t are those which are dead or dying, perhaps because they’re so convinced that what they’ve always done must be the only way that it refuses to accept anything new from anyone. No doubt natives were treated badly by Europeans, but then natives didn’t always treat their native neighbors all that well either, did they? The main difference being that Europeans prevailed because their technologies were superior and not because they were uniquely evil. Do Progressives truly expect us to adopt their Manichean view of native=good, non-native=evil? Is the demand that we all become flaggelants? Of course, natives are free to criticize her work, or anyone’s work. BUT that does not obligate anyone to accept the criticisms, or even to immunize the critics themselves against being criticized. For that matter, it may be rude to mock another’s religion, but it’s not as if those in a free society are not free to criticize religions. Is the proposed rule that some religions must be respected but others may be freely criticized or even mocked? Perhaps you’ve just got to grow a thick skin if you wish to write and have your works published? Maybe you could do something about it? I don’t know, read Nietzsche, and act upon it. Or read a history book about the city of Alexandria? or hop on a bus, and have a chat with Lindsay Shepherd? Or take the the first light to Montreal and have a drink with Gad Saad? Or you could say, ‘well, I’m not going to take this anymore’. When a whole a country has the deleterious habit to apologise at the first sign of dissent, it’s ripe for a barbarian takeover. There’s no surprise about Canada. Yeah, that’s what I thought. The PoMo must be laughing. They have every incentive to go after the wimps. Why is it so hard to state and fight for? Ideas are not people, people have rights, ideas don’t. This article is an excellent summary to read. My heart goes out to this author. I am truly sorry for what has happened to her, despite trying her best. There’s an old poem (first they came) about ‘them’ coming for people in the middle of the night and the author of the story said nothing, until they eventually they came for him and there’s no one else left to defend him. This is exactly where we are headed. Our world has become extremely divisive. A decade ago, I never imagined the world would become so intolerant. However, if people don’t speak up then things will continue to deteriorate. Divisiveness and intolerance has no bounds, as history teaches us repeatedly. Australia is currently debating if it should even celebrate Australia Day because Australia Day is supposedly racist and oppressive (despite it welcoming all Australians). The entire west has gone insane, so this article should not be a surprise to almost any Quillette reader. Sadly, despite the claim that the rest of the world is looking at Canada and thinking Canada is insane, we are all looking at Canada and saying “this totalitarian intolerance is happening here in [insert other western country] as well as Canada”. May I suggest you search up “Catherine Deneuve” and her fresh criticism of the #metoo movement. Look at the malice and intolerance from feminists, BBC, the Guardian and other mainstream media outlets. All roads of intolerance lead to Rome (so to speak). Intersectionality, identity politics, cultural appropriation. If we don’t stand up against the divisiveness, more authors like this will suffer the same fate. Denevue, sadly, is on the receiving end because of her opposition to a totalitarian ideology that shows no tolerance. Nicholas Kristakis, formerly of Yale (another victim of intolerance), said we should look for the things that unite us. Sadly, this lesson has been lost in the last decade. I wake up every day hoping that more people like Christina Hoff Sommers and Claire Lehman will stand up against the divisiveness. Pastor Martin Niemöller’s lament ca 1938. I am in agreement with you that this kind of intolerance is on the rise, and its justification . (I am an immigrant to Australia, by the way). But I do find Australia Day being held on this day very problematic. The Day does mark the beginning of a dark period for the Indigenous communities. Surely we can come up with a better day to celebrate – a day all Australians can celebrate. I am curious – why do you resist the change of the date? To me the date is highly divisive in this symbolism. I don’t think ‘Canada’s indigenous peoples’ necessarily implies that Canada owns them, anymore than ‘New Zealand’s treatment of its visitors’ does. The genitive has a range of functions besides simply indicating possession. Cultural appropriation is just another way of exploring the multi faceted and amorphous concept of ‘victim hood’. If there was any credibility to the idea that only black women can tell the story of black women or only Muslim transsexuals can truly understand what that is like or any of the thousands of other unique intersectional uniquenesses that encompass the human condition then there would be far fewer commentaries in the world explaining how white men have fucked things up so badly. The truly confusing question is why people who are subjected to these attacks don’t respond by telling their accusers that they are victims of indoctrination and mediocre mental abilities and that the idea of cultural appropriation is nothing but a mirage invented by those who prefer to see life through bitterness and anger. Quite. You can mark a genitive with an apostrophe (‘s) or a preposition (‘of’): ‘Canada’s indigenous peoples’ means precisely the same as ‘the indigenous people of Canada’. If that’s ‘problematic’ then ‘people of colour’ implies that people belong to a colour. Which is exactly what PoMos and Far-rights say. With an important difference, though. The PoMos create the problem, offer an escape strategy, so long as everyone stays in their colour. In other words “we can offer you justice so long as you remain a social warrior within your class”. It’s a schizophrenic situation. Once has to see/ *feel* the oppressive nature of race, a construct of society, but never escape from it to guarantee the pursuit of the noble struggle. PoMo is a true religion. It creates the problem, ex-nihilo, chain anyone to its premisses until the end of a struggle that is designed to never end. Or put it in another way, to do the same thing over and over again hoping for a different result. It’s pure madness. Those guys should be sent to a mental asylum. OK, this is where the article lost me. I’ve seen this a lot lately; writers are are able to see that a problem exists, but then end up contributing to it. In this case, you have Angie Abdou, unfairly tarred as racist by an oversensitive and overpowerful culture of social-justice victimhood. But instead of making the conceptual leap of realizing that the entire premise is flawed, and that racists on the internet is a largely fictional problem, you instead grant the very premises that are being used to vilify Abdou in the first place! “Look, I’m not denying that there’s a lot of real witches who deserve to be burned at the stake, I’m just saying this particular woman wasn’t one of them”. He’s resisting the dark side of the force, approaching the altar from a distance, reaching out with feeble hands, dragging his feet, but relishing on his future powers as plumes of smoke envelop his body. Jonathan, feel the power of the force….. come to me. I am your father, Jonathan. I never thought at it this way, but Foucault really is Darth Vader. And Chomsky is Obi One. Better than Yoda his grammar is. Such attacks have unintended consequences. Will future writers even attempt to get natives involved in their writing? No. Will white writers (who are 98% of Canadian authors) include any native characters in their novel? No. So native life and culture will be disappeared. Problem solved.